Published: April 18, 2013 at 07:58 p.m. 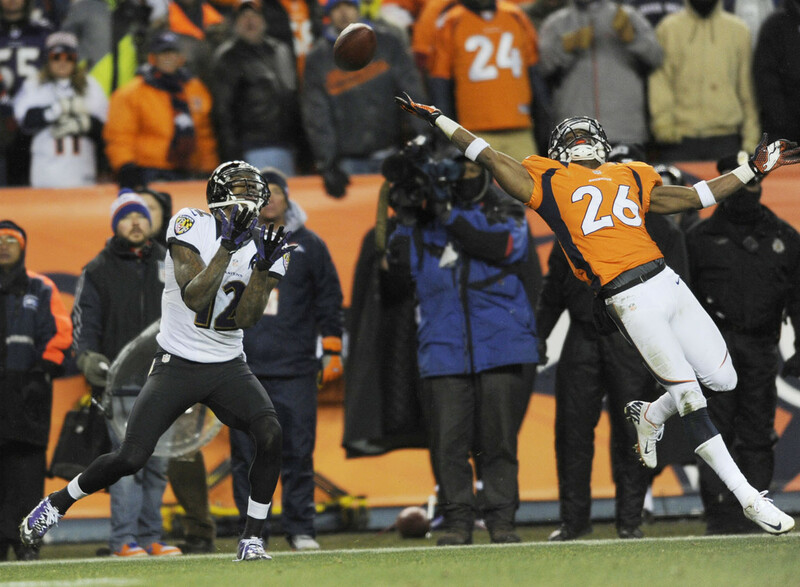 The Baltimore Ravens visit the Denver Broncos to help kick off a promising slate of games in the 2013 NFL schedule, and is one of the top games to watch this upcoming season. Poor Rahim Moore. The Broncos safety spent the offseason hearing nonstop about his awful mistake against the Ravens in the Divisional Round last year, and now he'll have to hear about it for another four months in the buildup to this rematch. The Thursday night opener will provide an early litmus test for Baltimore's rebuilt defense, especially in the secondary. It can't get much more high profile for the Broncos in the first two weeks of the season. They go from a matchup against the defending champions to the latest incarnation of the Manning Bowl. Peyton is 2-0 against his younger brother so far. Eli might need a win here to avoid going 0-2 after a tough opener in Dallas. Andy Reid doesn't have to wait long before heading back to the, uh, friendly confines of Philadelphia. Beyond the obvious storyline, this Thursday night game should be intriguing on the field. Reid bet big on Alex Smith in Kansas City rather than going after his old quarterback Michael Vick. The early evolution of Chip Kelly's offense will be fascinating to watch against an underrated Chiefs defense. Too often the NFL games in London have proven to be mismatches. This matchup sets up better on paper. Adrian Peterson is perhaps the best pick of his generation for a player that is worth the price of admission on his own. Ben Roethlisberger is not far behind. Week 5 doesn't have a lot of signature games on paper, but this game should be an early test for two would-be NFC contenders. In this rematch of the 2006 NFC Championship, Chicago's offense should be more entertaining to watch under Marc Trestman. New Orleans' sideline should be more entertaining to watch with Rob Ryan running the defense. The Redskins open the season in prime time, but their next four prime time games occur after the team's Week 6 bye. That's not by mistake. Even in a worst-case scenario, Robert Griffin III should be back on the field for this one. This probably will be the Redskins matchup the Cowboys win, before losing the Week 16 rematch with the playoffs on the line. No team has a more delicious schedule than the Broncos. Denver plays in perhaps the worst division in the league, so they can fatten up on wins there. But so many of the team's out-of-division matchups include capital lettered subplots. This one is obvious: Peyton's Return. Manning vs. Luck. Can't wait. The Week 17 matchup between these longtime rivals last season was an instant classic because of Adrian Peterson's performance. Their playoff rematch a week later instantly was forgettable, in large part because of Joe Webb. It's worth wondering how secure Christian Ponder's job will be by the time this game rolls around. The Jeff Fisher Bowl! The rematch of one of the weirdest Super Bowls with the best endings! St. Louis is getting overlooked in the NFC West, but their defense absolutely can compete with Seattle and San Francisco for a playoff spot. As Titans fans know, Fisher's team almost always contend. Admit it. Mobile quarterbacks are more fun to watch than the alternative. When we think of modern physical freaks of nature that can run and show off ridiculous arm strength, the conversation starts with Cam Newton and Colin Kaepernick. San Francisco should have a major edge here in the play-caller department. A matchup of two recent champions trying to get back to the big stage. The quarterbacks are easy to focus on here, but they are mainstays. The defenses for both teams are much bigger questions. New York and Green Bay both need to find a consistent pass rush in 2013, or get carved up by top-shelf quarterbacks. Peyton Manning is 37 years old. That's only one year younger than Charlie freaking Batch. The point: There are not going to be that many more Manning vs. Tom Brady matchups. Savor them. This is the game we thought would have decided last year's AFC Super Bowl representative. It didn't happen; and both Manning and Brady continue to chase that one more ring. After the traditional Detroit and Dallas home games, the third Thanksgiving game rotates every year. But would anyone except a bunch of NFL owners protest if we just made Pittsburgh-Baltimore the nightcap every year? The hardest-hitting rivalry in the NFL just fits so well in this spot. No two teams use their defenses more creatively than the 49ers and Seahawks. No two teams have head coaches with a better, more strained history against each other. No two young quarterbacks are any more exciting than Russell Wilson and Colin Kaepernick. No game likely is to mean more in the NFC playoff race. We've got a lot of Packers games on our list; that's just how things worked out. And that's what happens when Aaron Rodgers is your quarterback. If we could pick one player to start a franchise with, it's Rodgers. If we could pick one quarterback to unfairly get blamed for repeatedly breaking your heart, it's Tony Romo. Last year's NFC Championship was an underrated classic. Matt Ryan played about as well as you can in a losing effort. There was a monster comeback. There was not a lot of defense until the 49ers absolutely needed it. History tells us that one of these teams could be fighting just to get back in the tournament by Week 16. It's hard to imagine this game not meaning something. The NFC North has a very difficult out-of-division schedule on the whole. There are no easy games in the division, either. That sets up a Packers-Bears finale where the loser could be staying home for the offseason.